Come join our 30th Year Celebration! 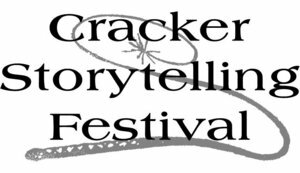 The Cracker Storytelling Festival Committee will be celebrating their 30th year. We are excited to have a select group of Florida storytellers to bring you an exciting and entertaining day with your students. This event is local, fits curriculum for all grade levels and is very inexpensive. Carrie Sue Ayvar entertains listeners with her Spanglish style and tales from many cultures. Tamara Green uses vivid costumes and dramatic presentations to keep listeners on the edge of their seats. Mitchell O’Rear engages audiences with his dramatic storytelling. Katie Adams weaves stories with her voice and movements. Cheryl Floyd uses her heritage to weave great Cajun stories that will conjure up images and sounds unlike any other. Mark Koruschak will take us into the past with his cow camp site demonstrations and tales of the past. Robin Schulte tells unique stories in a unique way that will keep you spellbound and hanging on every word. “TVSHKA” Vann V. Samuels, Native American Flute player and Storyteller. Hank Mattson is a working Cracker Cowboy Poet who lives in Florida. Madeline Pots tells personal stories, laden with gentle humor, that are engaging and relatable. Pat Nease uses her sense of humor and lively style to tell tales that have delighted audiences across the south. Kim Rivers and Nancy Crocford: "StoryMusic" intertwines live music with storytelling’s oral tradition. Charles Frierman is a master of improv and children's storytelling. Judge Nelson Bailey is a Florida history storyteller who tells tales of Florida though a collection of true tales. Yasu Ishida combines traditional Japanese theatre, music, origami, magic, and storytelling. Mary Lou Williams tells the tales of Fractured Fairy Tales. Schuyler Ford will immerse you in the enchanted legends of her Dutch and German ancestors. Kay Byrnes stories capture the imagination and heart of adults as well as children. Connie Trama loves to tell humorous folktales and participatory stories; especially if those stories contain a song. Linda Chancey loves tongue twisters and silly stories about squirrels and outhouses and dogs and cats! Melinda Munger is a highly regarded storyteller and author. Jim Mittlelstadt is a past president of the Florida Storytelling Association. He hales from Minnesota and some of his stories are about growing up in the amazing winters there. The event is open to the public all three days. Storytelling is part of the curriculum for all grade levels and our tellers tell stories to all age groups. This is a great, inexpensive, chance for schools to come and partake in this wonderful opportunity to learn without knowing it. If you have any questions or concerns you may contact us at crackerstorytellingfestival@gmail.com.